I picked my camera up today to take a picture of Sara Wells today in her sweet little outfit. I actually made it 3 years ago for a baby gift. But when Ann Tatum came, she was tiny and I knew it would never fit! So I put it away and just found it yesterday. I was going to take pictures to send to my mom because I made it out of one of my baby sheets. However, I never got a great picture of the outfit because as soon as I picked up my camera, Ella ran over and picked Sara Wells up for a photo op. Then she and Miller followed me into Sara Wells' room insistent on having their picture made. So we had a family photo shoot. These pictures are just so sweet to me, I had to share! I have had a lot of people lately ask me how I make Miller's t-shirts. I promise you, it is very easy!!! I am not an expert by any means, but here are a few tricks I have learned along the way. One of the most important things you need is an iron-on adhesive. I usually get mine from Hancocks. It is really cheap, maybe $1.50 or $2.00 a yard. One yard will go a long way. I don't think I even used a yard to make all of Miller's t-shirts. First thing is to draw your pattern. (This is always the step that takes me the longest! I have no artistic ability, so for me to draw something that I like takes forever!). Then trace your applique onto your fabric. Cut out your applique. After I cut it out I usually iron the applique again to get it good and hot and make sure the adhesive is stuck to the fabric. Then pull of the paper on the back of the adhesive. Place the applique on the t-shirt and iron on. For this t-shirt, I did a wide zig-zag. But if you want even faster and easier, you can just do a straight stitch leaving a raw edge. So many clothing lines are doing their appliques this way and it is so cute and sooo easy! You can also do appliques that look like they have been done by a monogramming machine. You follow the same steps as above, but you need to put a stabilizer underneath the t-shirt. I prefer one that tears away. Again, you can get this at Hancocks for pretty inexpensive. Unfortunately, I decided to do this post after I had made all the t-shirts so I do not have any step-by-step pictures. But if you look closely at this picture, you can see why you need a stabilizer. At the bottom of the face, you can see where it is slightly puckered. I did not realize, but I did not cut out a big enough piece of stabilizer. When I do this type of applique, I usually set my stitch length between 5 and 6 (usually just depends on how big the applique is). I set the stitch width very tight, on my machine almost to 0. The best thing to do is get a scrap piece of fabric and with a contrasting thread just play with your stitch length and width to see what you like best. I hope this was helpful! If you can sew a straight stitch, you can make an appliqued t-shirt! Look how much bigger Miller looks. He looks like such a baby on the first day and now he is just a little boy. They grow so fast!!! All the kids with ViVi. Vivi is the receptionist/admin assistant at Covenant. Ella fell in love with Vivi when she was an itty bitty baby. Every day on the way to our car we stop in and see Vivi! Victoria is the most wonderful, loving, joyful woman who loves the Lord more than anything! We love you Vivi!!! This blog post was intended to be two posts. I meant to post the first half last night, but Murray and I got home late (9:00) from dinner with friends and I was too tired to post. What a difference a day makes! About a month ago I started noticing some accumulation of pine straw, leaves and moss in our kitchen window (the storm was just a little loose). It did not take long to see this debris being brought in by a sweet, hard working Mama Bird. She worked and worked to make that nest perfect. Until about a week ago she started bringing something different into the window, little bugs and worms. Along with that we heard very, very high pitched chirping (squeaking). Mama Bird had 4 little baby birds! It took several days for us to even be able to see the tiny birds and all we could see was the little yellow beaks opening for their food. We went out of town this weekend and when we came back the baby birds were much bigger and much more courageous. They had started peeking out of their nest and looking back at us. As you can imagine the kids have loved every minute of it! They loved watching Mama Bird build her nest and love checking in on the babies all the time! Here are a few pictures of Miller checking on the babies (Sunday). Look closely at this picture and you will see two baby birds looking right back at you! Usually on school days, we get home, I get Ella and Miller out of the car, quietly carry Sara Wells up to her bed, put Miller to bed and then Ella has a little snack or we talk for a little bit and then she has rest time on the couch. Today I was really counting on this schedule working because I was taking dinner to someone and we were having a friend over for dinner. Of course the days that you really count on having "your time" it never works out that way. Ella was very talkative and really wanted to help cook dinner so I gave up on rest time and we started making the bread. As soon as we started making noise around the window, the baby birds started chirp chirp chirping away. I walked over to the refrigerator and evidently the birds came out of their nest. Ella had not seen the birds come out that far, so she wanted and up close view. I put her up on the counter to look at the birds and I noticed they were out much further than they had been before. And then I realized what was going on. Ella and I watched all four baby birds learn how to fly. It was one of the coolest things I have seen! Baby Bird Four (Ella named him Bert) was the last little bird left and he did not catch on quite as quickly. He took about 3 or 4 minutes to muster up the courage leave the nest. Bert flapping his wings trying to get the hang of it. Ella always is the encourager! Here she is encouraging Bert that he can do it! After they all flew out, Ella and I quickly ran outside to see if we could see them outside. Bert did not make it very far. Here he is right below the window. Ella and I stayed outside for about 30 minutes watching the baby birds. The entire time Mama Bird flew around in between her babies checking on them. We would randomly see them fly/fall from branches and tumble down the hill as they hopped along. It was definitely an experience I will never forget! Here is a close up of one of the babies. I feel like a proud Mama Bird, all my babies have left the nest. Our kitchen window is now quiet and none of the babies have come back to visit. Hopefully Bert won't go too far. I like to think he will build his nest in one of our trees or at least come back to say hello one day and sing us a song. I will always have a special place in my heart for Mama Birds now! One of the best things about being a pastor's wife is that your husband gets to baptize your children. Murray has had the privilege to baptized all three of our children. This past Sunday he baptized Sara Wells. On the way to church I was talking with Ella and Miller about what we were going to do and explaining why they were going to stand up front with Daddy. Ella asked why we were baptizing Sara Wells. Trying to explain the Covenant to a four year old is not the easiest thing. But I ended our conversation telling her Sara Wells' baptism serves as a Sign and Seal of the Covenant. As Murray baptized Sara Wells, I kept thinking of my conversation with Ella and the full significance of what was going on really hit me. Baptism is a sign of the Covenant in that it represents the membership that a baptized person holds in the Covenant. It doesn't grant them membership, it represents the membership they already hold. Baptism is also a seal. For adults, it serves to remind them of the sealing work of Christ on their behalf represented in the washing with water. For infants today, like those who received the sign and seal in the Old Testament, it represents an engagement to be the Lord's. At that moment with Murray holding Sara Wells and Ella and Miller standing with Murray and me, I realized how deep our heritage with the Lord is. Thousands of years ago, he made a Promise to Abraham that he is still keeping and will not stop keeping. Watching Sara Wells be baptized reminded me how precious we all are to the Lord. So often I go through my day and I just don't think about how the Lord is always working in my life. I just don't think about the significance of being in the Covenant Family of believers. Because of the Covenant God will never stop working in my life. He is always at work in me and in my children. That is amazing! No matter what I do, God will not break the Covenant he made and he will continue to work in my life drawing me closer to him. And is already working in the lives of Ella, Miller and Sara Wells to draw them to himself! Wow!!! I am sure that anyone from Cahaba Park Church reading this will wonder how in the world I was thinking of all of that during the baptism because it did not go quite as smooth and peaceful as these pictures make it look. This last picture is a little glimpse of what really went on (of course my camera battery died right in the middle so the entire event was not documented, including the actual baptism). You see Murray grabbing Miller's arm as he is talking. I will say in Miller's defense that I had to give him his nebulizer before we went to church because his asthma had flared up so bad he could not stop coughing. So, by the time we got to church Miller was wired! Also, most kids are intimidated when they go to the front of the church because the preacher is talking to them in front of everyone. Well, when your daddy is the preacher, you feel very comfortable standing up front. The intimidation factor is zero! Ella and Miller had joined Murray up front during the song before the baptism, which was very sweet until Miller started dancing and spinning in circles. So by the time the song was over, Miller felt very comfortable up front and started walking around, going behind the pulpit, crossing in front of Murray while he was talking (the picture above), protesting very loudly that he did not want to do what we were asking him to do. At one point Miller started pulling on the curtain that runs behind the entire front of the "sanctuary" (really just blocking the lockers since we meet in a high school). I just knew the curtain was going to fall. The only thing worse really that could have happened was if Miller ran down the aisle either laughing or crying and we had to chase him. I felt so bad for Sara Wells that all the attention on this special day was on her brother and sister. But you know what, Sara Wells was baptized and the Lord was not distracted one bit! All of his attention was right there at that moment as His Sacrament was administered to his precious child! Of course I was a little embarrassed and frustrated by it, but I just have to laugh. Miller was just being Miller and God was not distracted by a two year old! One thing is for sure, no one at Cahaba Park can feel bad about what their children do during a baptism! Proud Aunt Kim introduces my newest niece and nephew Chloe Hays and Fitzpatrick Lee! Two healthy, beautiful babies! 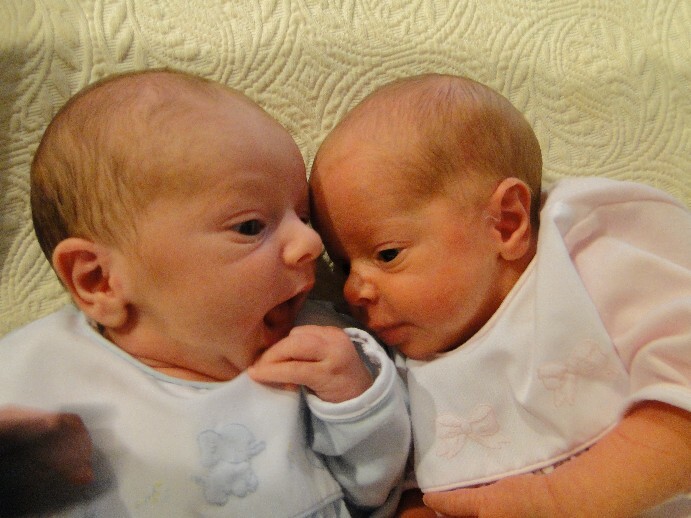 Chloe and Fitz were born April 24 at 11:30 (Fitz) and 11:32 (Chloe). 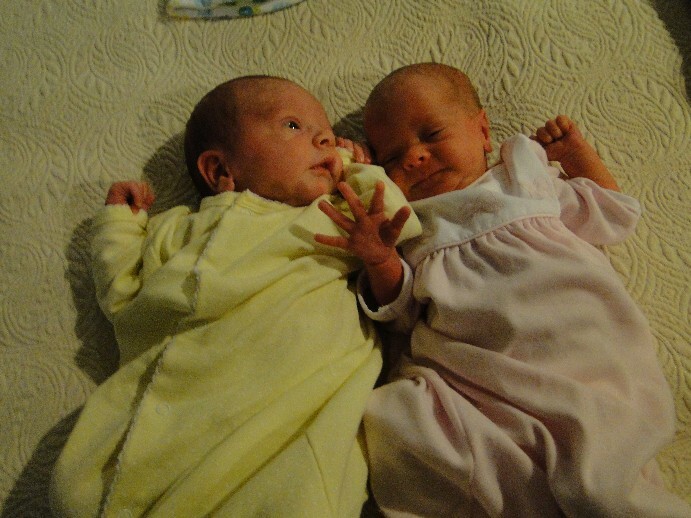 Fitz weighed 5 lb 12 oz and Chloe 5 lb 2 oz. I know I am a little late in introducing the newest members of our family, but I really wanted to get a picture of them together. Chloe had some breathing issues when she was born and taken directly to the NICU. While in the NICU Chloe had a few more premie issues, but everyday she got stronger and stronger and finally got to join Fitz at home Friday. 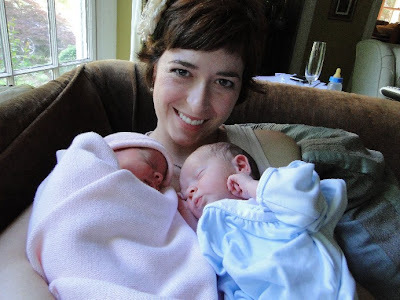 These are some of their first pictures together at home. Congratulations Wellon and Stephen! We cannot wait to spoil Chloe and Fitz! Ella got a Big Girl Bed when she turned 3. I probably waited too long, but I was not ready to give up her crib! It was a very big deal when she got her bed. We came home from school and Murray surprised Ella with her bed and her brand new bedding. Ella was thrilled! Miller's change was not quite the same experience. We both knew that Miller's time in his crib was coming to an end, but I just kept pushing the thought out of my mind. Trying to delay the inevitable. It could only last for so long. About 2 weeks ago, Miller climbed out of his crib for the first time. After his taste of freedom, there was no going back. Especially since Ella was getting out of bed in the mornings to go to the bathroom. When he climbed out after his nap, I knew that the time had come to change his bed. That night things got crazy and about 7:00 I realized we had not put together Miller's bed. With our propensity to end up in the emergency room, I knew the more chances we gave Miller to climb out of his bed, the more likely it was we would end up at Children's with a broken arm. So, about 7:00 Murray started putting together Miller's bed. An hour an half later after the skill saw, power screw driver and hammer had all been put to use, Miller's bed was finally ready. Poor thing, he does not even have sheets that fit his bed, has no rails and no comforter. But he could care less. He is just thrilled to be in a bed like Ella. After about a week of serious discipline, he has finally learned how important it is to stay in his bed. Here are a few pictures of Miller in his poor bed with all of his "stuff." If it was this last minute for Miller, who knows what it will be like for Sara Wells! I know that I sound like a broken record, but the time is just flying by! I cannot believe that Sara Wells is 4 MONTHS OLD! Where does the time go??? Here are a few cute pics of our little Wellsy. For the life of me I could not get her to smile. But oooo, don't you just love those cheeks! This past weekend I went to the beach with a group of girls from church. What a great weekend! I laughed and laughed and talked and talked and talked! In the midst of my days I forget how important it really is for mommy to have interaction with other women that is not just over chicken nuggets at Chick-fil-a! I definitely feel refreshed after the weekend. Murray: What are we having? Kids: (yelling at the top of their lungs) The best time ever!!!!! And I think they really did! 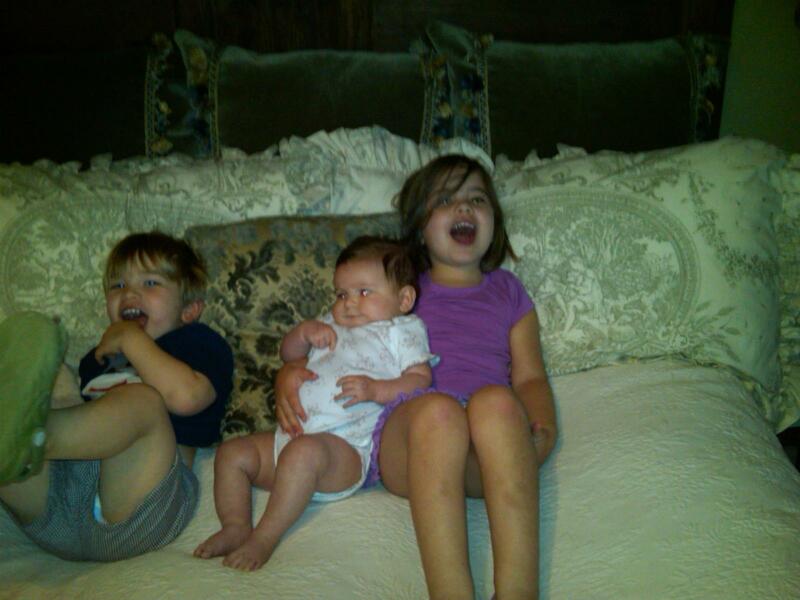 Murray sent me pictures all weekend of the kids. This picture is Friday morning. Murray got the kids dressed, fed, packed lunches and even made the bed! There were no tears and the kids are yelling "The best time ever!" They even made it to school on time! Way to go Daddy-O! 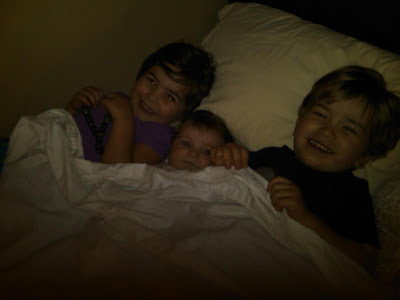 The kids all snuggled up Friday night in Miller's new big boy bed (more on that later). Mommy had "The Best Time Ever"
Kids had "The Best Time Ever"
Murray had "The Best Time Ever"
What a weekend for all!